Information processing and storage in the brain involves fast communication between neurons. In the central nervous system a neuron can be connected to up to thousands of other neurons through brain synapses, specialized junctions where the axon of one neuron meets the dendrite of another neuron (two examples are shown by red arrows on the images below). Over time, the efficacy of synaptic transmission can vary depending upon synaptic activity, a mechanism called synaptic plasticity that is largely responsible for learning and memory. During synaptic plasticity, proteins can be specifically accumulated at synapses through protein-protein interactions. The group of Daniel Choquet at the University of Bordeaux Segalen aims at gaining a better understanding of protein accumulation at synapses to unravel the molecular mechanisms underlying memory storage in the brain. Figure 1. the donor and acceptor proteins co-localize in neurons. Using primary neuronal cultures from rat hippocampus, PhD student Anne-Sophie Hafner studied the localization of interactions between two specific neuronal proteins; an intracellular scaffolding protein and a transmembrane receptor. She transfected neurons with DNA encoding a synaptic protein coupled to Green Fluorescence Protein (GFP) (donor, green image) and a transmembrane protein coupled to mCherry (acceptor, red image). She used the Lambert Instruments FLIM Attachment (LIFA) on a confocal spinning disk to monitor GFP lifetime with or without acceptor proteins. During the experiment, cells are first imaged through the spinning disk to ensure the presence and co-localization of the donor and acceptor proteins. As shown in figure 1, both proteins are co-localized in all cell compartments, the synapse scaffolding protein being enriched in synapses. Then, the cells are imaged on the LIFA attached TRiCAM, to generate the FLIM image (lifetime color coded for each pixel, last image). Figure 2. the donor and acceptor protiens interact specifically in synapses. An example lifetime image of a neuron is shown in Figure 2. 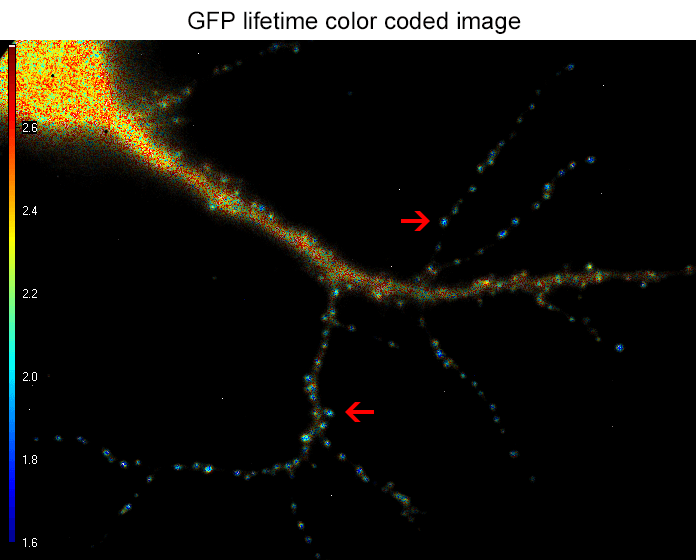 In the soma and dendrites, GFP lifetime is high (i.e. no interaction between the proteins of interest), and not different compared to GFP lifetime without acceptor fluorophore which stands around 2.6 nanoseconds. In contrast, GFP lifetime in synapses is dramatically decreased in presence of the acceptor protein to a mean value of 1.9 nanoseconds (i.e. the proteins of interest are interacting specifically in synapses). The Lambert Instruments FLIM technology allowed us to show and quantify for the first time the synapse specific interaction of the two proteins of interest.